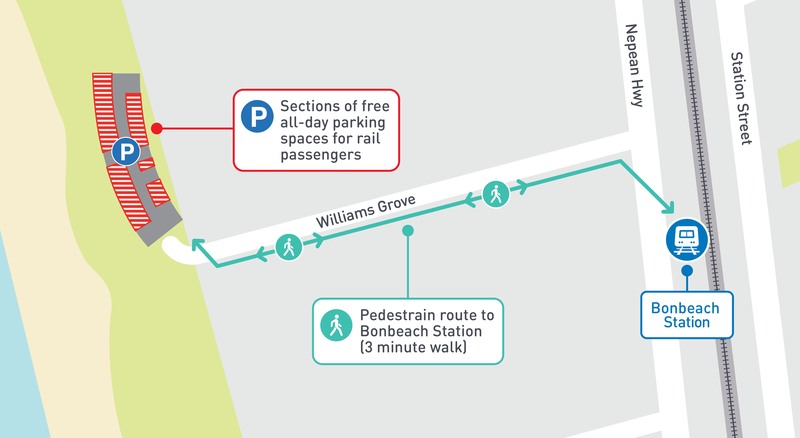 Temporary and long-term car park closures and changes to pedestrian access on the Frankston line. Temporary and long-term car park closures and changes to pedestrian access, while Level Crossing Removal, power and signalling works take place. 15 car spaces in the Cheltenham Station car parks are closed. 15 car spaces in the Mentone Station car parks are closed. 15 car spaces in the Chelsea Station car park are closed. The entire car park is closed. Sections of the Seaford North Reserve car park, located a 3 minute walk from Seaford Station. To check the map, click here. Part of the Chelsea Library car park, located a 3 minute walk from Chelsea Station, To check the map, click here. Sections of the Bonbeach Foreshore car park, located a 3 minute walk from Bonbeach Station. To check the map, click here. For accessible parking, use the Chelsea or Seaford Station car parks. 20 car spaces are closed. 50 car spaces are closed. 10 car spaces are closed. The bicycle hoops have been relocated to Bonbeach Station. The bicycle lockers have been removed permanently. 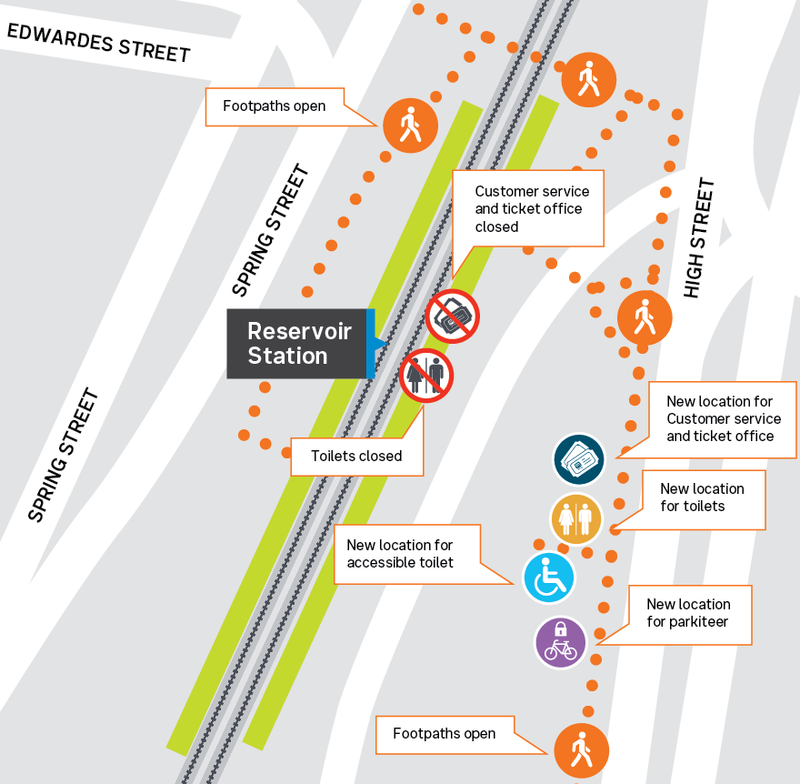 Approximately 43 car spaces in the Essendon Station car park (off Russell Street) will be closed, due to Buckley Street Level Crossing Removal works. Approximately 184 spaces in the Russell Street car park. Approximately 166 spaces in the Rose Street car park. The existing alternative car park of up to 100 parking spaces at Moreland Station will remain open for use. Bus stop relocation at Reservoir Station. 40 car spaces are closed within the east section of the Cross Street car park. Accessible car spaces have been relocated to the western side of the Cross Street car park. An alternative temporary car park has been constructed adjacent to the Tottenham Station car park on Rupert Street during this time. The following bus stops at Carrum Station will be relocated, while Carrum Level Crossing Removal Project works take place. To check the new bus stop locations, click here. 12 car spaces are closed, while maintenance works take. The car park is closed, while station upgrade works take place. There will be night works between Kensington, Craigieburn and Flemington stations, while maintenance takes place. Due to the nature of the works and heavy machinery required, including special track machines, excavators, front end loaders and chainsaws, medium – high level construction noise will be experienced. While these works take place you may also experience more local traffic from work vehicles and replacement bus services. Every effort will be made to complete works within these time frames, some activities may need to be rescheduled in the event of bad weather or other unavoidable circumstances. These works are to ensure the ongoing safety and efficiency of the network. Thank you in advance for your understanding during these works. There will be night works between South Kensington and Sunbury stations, while maintenance takes place. 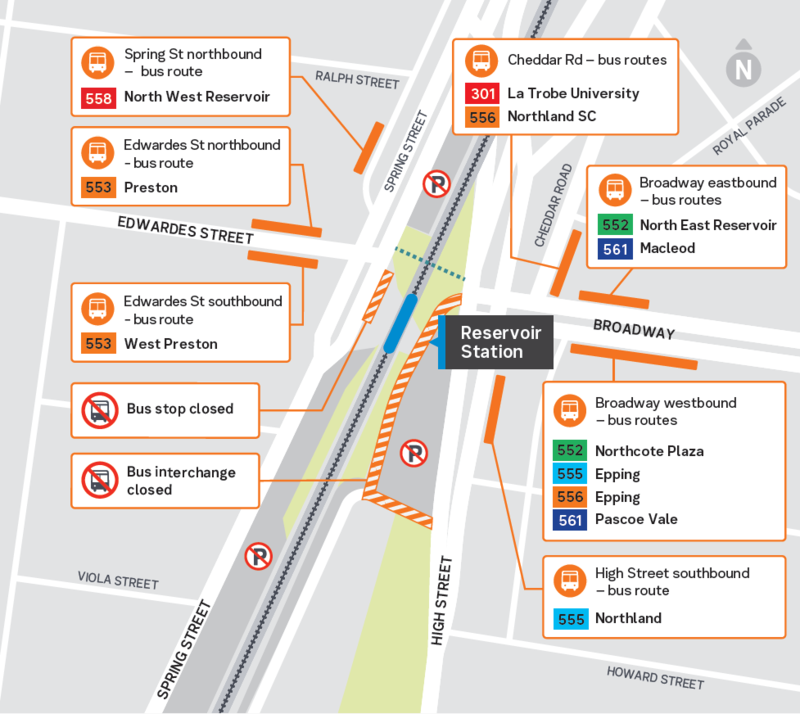 Due to the need for last minute maintenance work, there will be night works between Broadmeadows and Coolaroo stations. Due to the nature of the works and heavy machinery required, including specialised track machines, excavators, front-end loaders and chainsaws, medium – high level construction noise may be experienced. Due to the need for last minute maintenance work, there will be night works between Westgarth and Heidelberg stations. There will be night works between Southern Cross, Sunshine, Kensington and Coburg stations, while maintenance takes place.